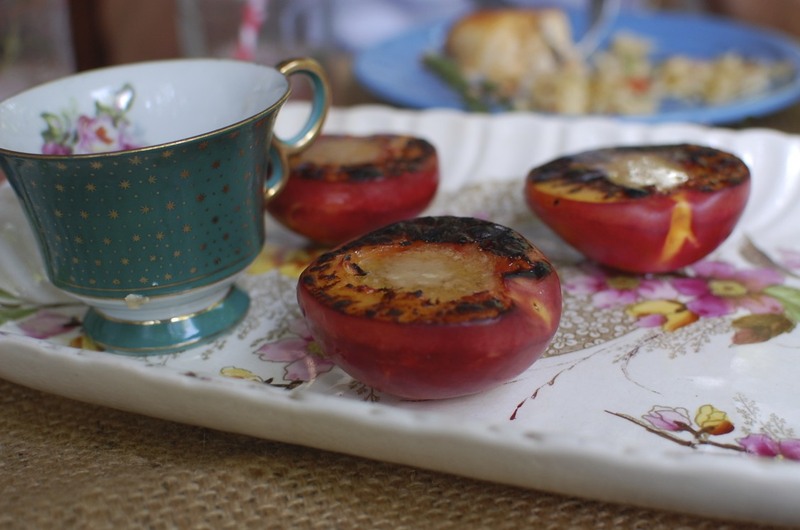 Grilling fruit might be the best idea ever. Even competing with winners like sliced bread, electricity, and indoor plumbing, I think grilled fruit is a frontrunner. It’s almost like super low-maintenance pie–no crust, no oven, no fuss. Just split a peach, take out the pit, and toss it on the grill face down. In a couple of minutes, you have a warm, juicy dessert with a hint of smokiness. That’s really all there is to it! To make a grilled peach really extra special, I made some hard sauce to go with. I ran across hard sauce in England (that and clotted cream, OMG) and have never really known what was in it. Turns out, it’s really just butter and sugar, so I suppose we shouldn’t be surprised it’s so good. For the peaches, I added a splash of bourbon to go with the smoky grilled flavor of the peaches. 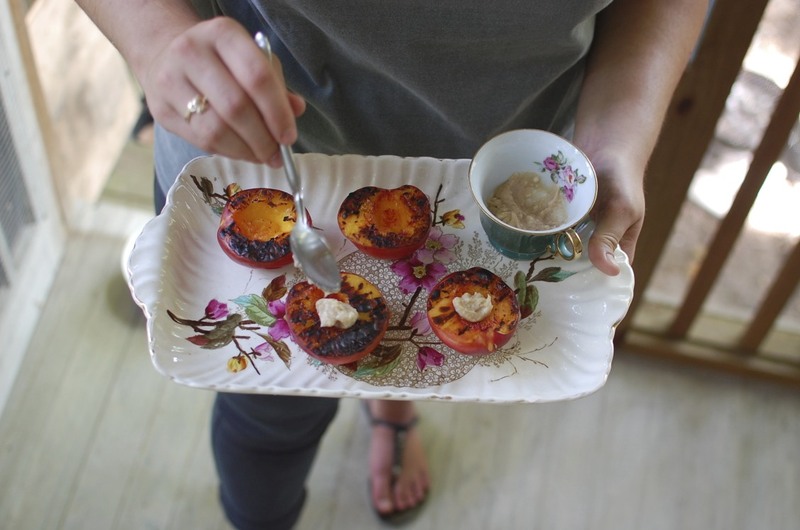 To grill the peaches, wait until you’ve cooked everything else, and the grill is cooling down. (My grill was sort of too hot when I made these, but I couldn’t wait!) Brush a teeny bit of olive oil on the cut size of the peach, and put the same side face-down on the grate. It should only take a couple of minutes, so watch carefully. Using a fork, mix everything together. 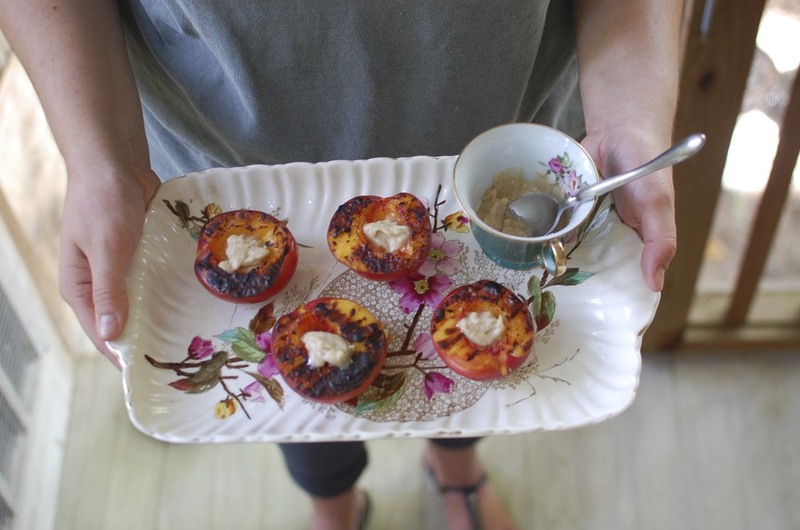 Drop a little dollop of hard sauce on each peach. Enjoy! I’ve never made real cinnamon rolls with yeast before these, and I don’t think I’ll ever be the same again. 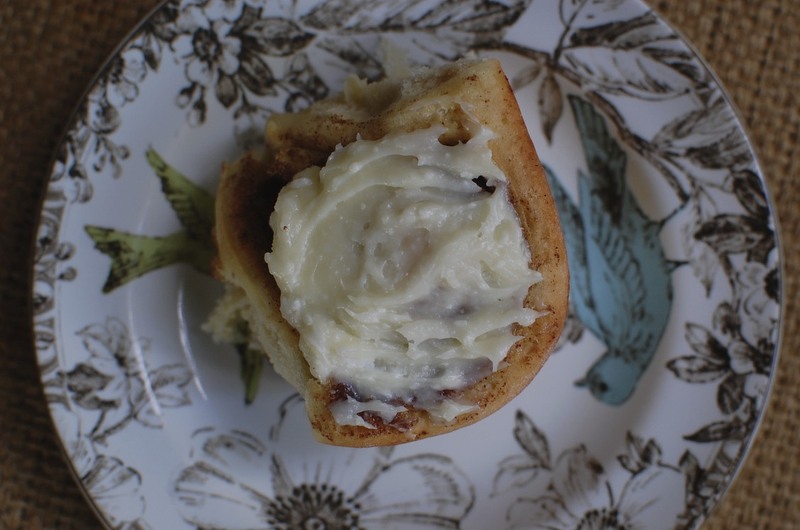 Admittedly, this represents a life of luxury that is 100% untenable, but I decided while eating one of these cinnamon rolls that I would never eat anything else. Terrible, terrible idea, but I was ready to give up everything for those swirls of cinnamon sugar. Instead, I thought it wise to eat one and then foist them on my coworkers–spread the wealth or something like that. 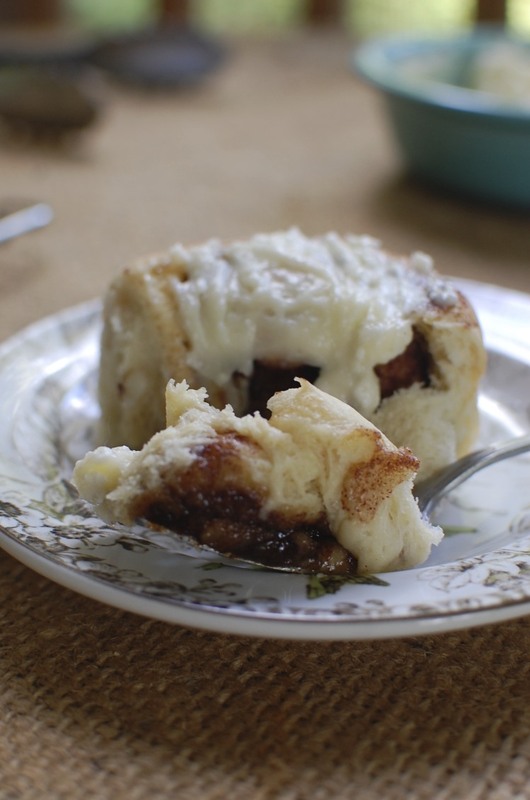 Yeasted cinnamon rolls are one of those things that just require a lot of time and attention. 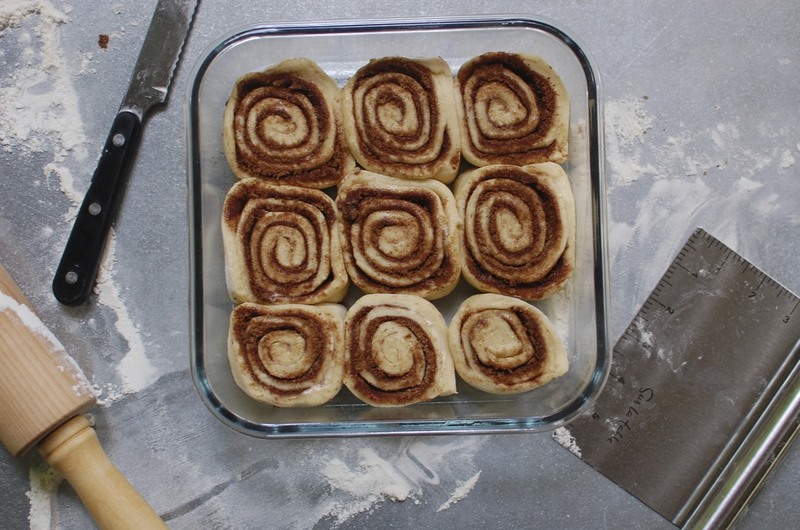 The dough is sticky and finnicky, and it has to rise twice–not to mention the rolling out, rolling up, and cutting of the rolls themselves. It’s the sort of thing that you should do the night before, or aim for brunch. You need coffee before tackling this project. 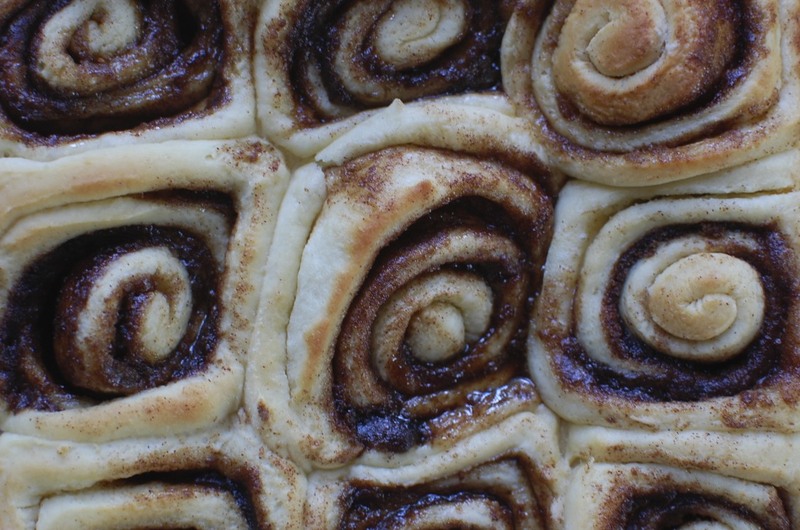 Because cinnamon rolls are such a time-consuming endeavor, you’ll have lots of time to read a book, catch a nap, or troll celebrity gossip websites while you wait for the dough to rise. Not that I know anything about trolling celebrity gossip, that’s just an example. This is also the kind of breakfast that will impress the pants off of people, so plan to take these puppies out! Be warned: health food they are not. Butter and brown sugar are doing the real work, and the cinnamon offers its classic spiciness to the mix. By the time you’ve done all the proper waiting, and you’re just putting the pan of rolls into the oven, you’ll find ourself really, really hoping that they turn out okay. I mean, you’ve spent a lot of time making sure that you did all the right steps, you’ve already had to clean the table twice, your stomach is grumbling, and you’re maybe going to be late to brunch. But by the time you sit back down to your celeb gossip (ahem BOOK ahem), you’ll catch a whiff of the bubbly sugar, and you’ll know that you made the right choice. To begin, melt the butter for the dough in the microwave (or in a pot if you want to get all fancy). Then, combine the melted butter with the milk, and microwave both for 30-45 seconds, or until the mixture is warm. It should be between 105 and 115 degrees F, so it should feel warmer than your finger, but not hot. Combine the milk with the yeast in the bowl of a stand mixer fitted with the paddle attachment. Then, add one cup of the flour, the salt, sugar, and egg. Mix vigorously for a minute or until completely combined. Switch to the dough hook attachment. Slowly add the remaining flour, 1/2 cup at a time, mixing on low speed. 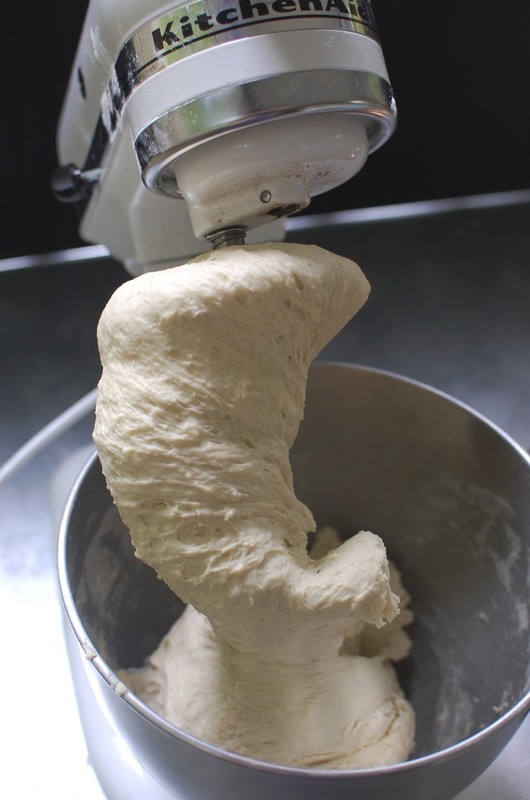 When the dough is pulling away from the walls of the bowl and is not very sticky to the touch, take it out of the mixer, make it into a neat ball, and plop it into another bowl, coated with cooking spray. Turn the ball over once to cover it in oil, then cover the bowl gently with a tea towel and place it in a warm spot. Let the dough rise for about 2 hours, or until doubled in size. While the dough is rising, prep the filling. 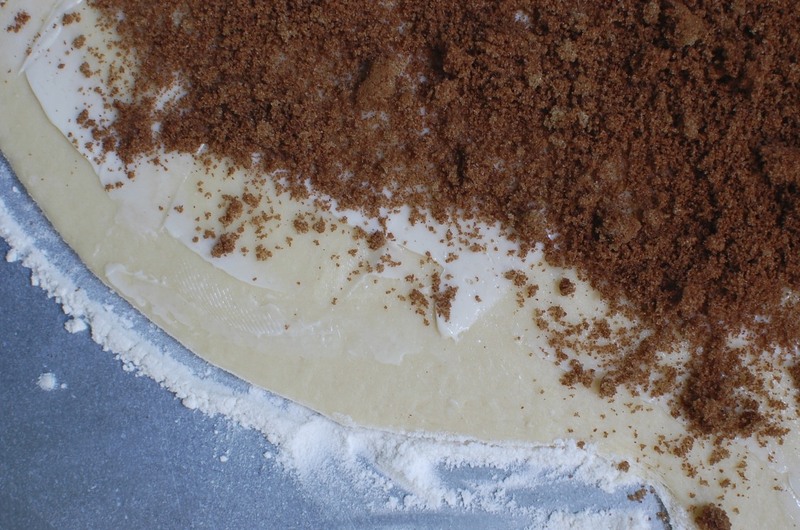 Make sure your butter is coming to room temperature, and mix together the brown sugar, cinnamon, and salt. 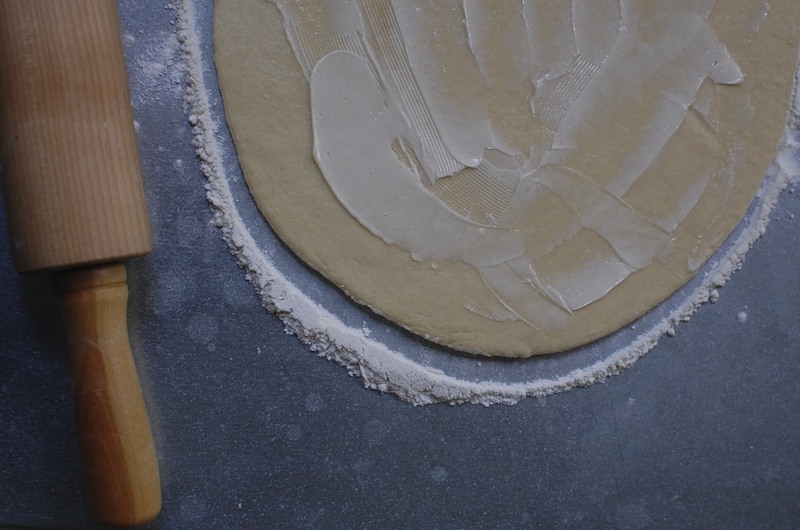 When it’s done rising, turn the dough out onto a lightly floured surface. Roll the dough out into a roughly rectangular shape. It should be about a quarter-inch thick. Using a butter knife of spatula, gently spread the room-temperature butter on the dough, leaving about a half-inch around the edges. Then, sprinkle the cinnamon sugar mixture over the butter. 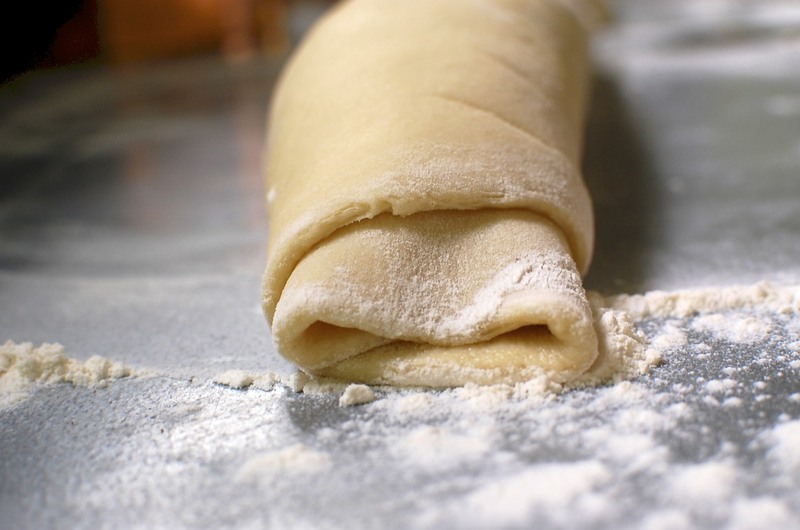 Using your fingers, start rolling from the long side of the dough rectangle, and be sure to gently pinch the roll together to keep it tightly rolled. When you’re done, place the seam side down on the table. Measure one inch increment on the log, and then use a sharp serrated knife to cut the rolls. Place the rolls into a greased 8×8 baking dish. You should be able to fit nine, but it will be snug. 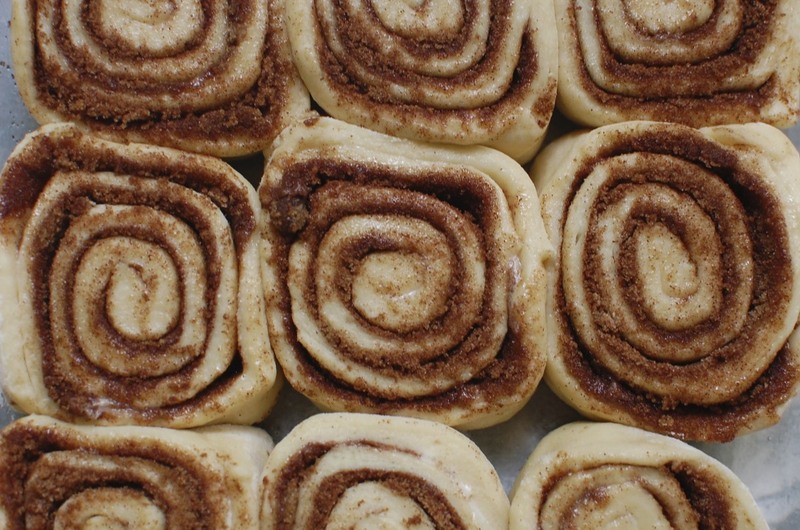 For me, this recipe seems to make about a pan and a half (12-14 rolls). When they’re all in, cover the pans with a tea towel for their second rise. This time, they will almost double again, but it will take only 45-55 minutes. Make sure you give them time, the second rise is what makes them fluffy. When they’re done rising again, preheat the oven to 375 degrees F and bake the rolls for 20 minutes, or until browned on top. While the rolls are cooling, put the glaze together. Mix the room temperature butter and cream cheese with the powdered sugar and vanilla. That’s it! Let the pans cool for at least 20 minutes, then glaze and serve (with coffee and a nap)! Remember how I said I was really holding on to the last few days of summer? I meant it. 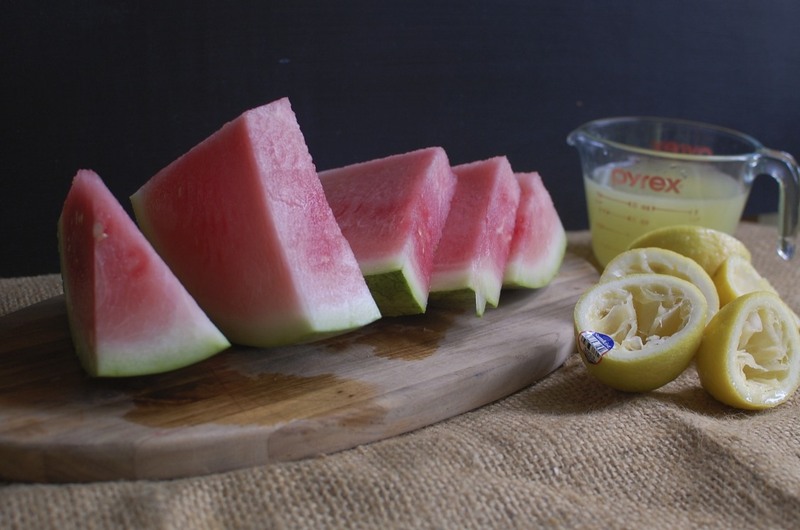 This lemonade is like summer in a glass–it’s sweet, refreshing, and so pink! Watermelon has long been my second favorite fruit (behind strawberries), but I feel like one shouldn’t waste time with a sub-par watermelon. It’s hard to tell (I’m the person tapping EVERY watermelon in the store), but when you get a good one, it’s something to remember. I love to eat watermelon with a little bit of salt on it–not because it’s some hip foodie thing to do but because that’s how I always experienced watermelon: sitting in the sand or on the edge of a boat, in my bathing suit, dripping with saltwater, watermelon juice running down my chin. 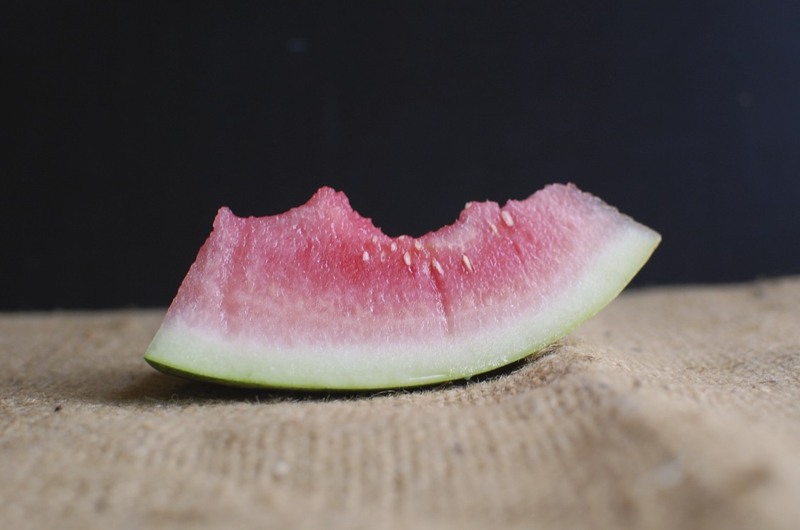 By the time I stopped for a snack, I would have been thoroughly pickled with pruny fingers, so some salt inevitably made its way onto the melon. As it should be. This recipe is actually a way to use a less-than ideal watermelon. This one was juicy but just wasn’t all that flavorful. But once it was blended up and mixed with some simple syrup and lemon juice, you’d never know. I also added some rosemary to the simple syrup, but mostly because that’s a hip foodie thing to do, I’ll be honest. It does add sort of an earthy flavor so that the sweetness isn’t overpowering. 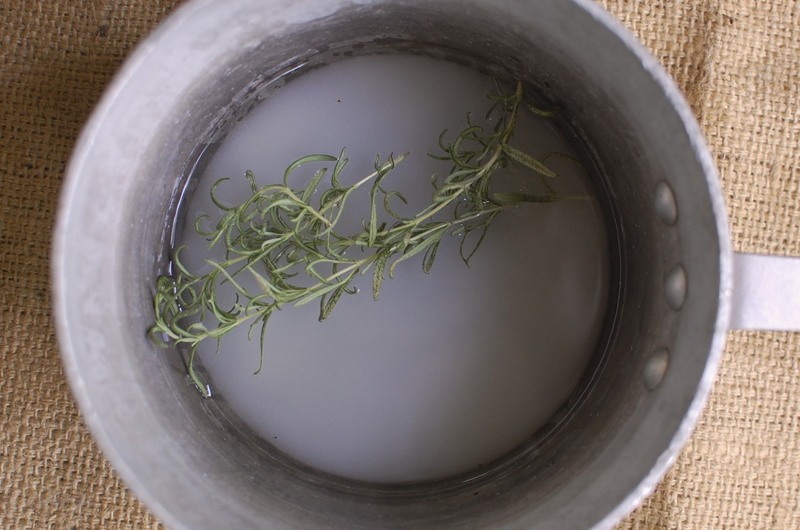 In a saucepan, heat the sugar, water, and rosemary until almost boiling, stirring constantly. When the sugar is dissolved, remove the syrup from the heat and let it cool. Juice all the lemons until you have 1 cup juice. I usually strain it to get rid of the pulp and seeds. 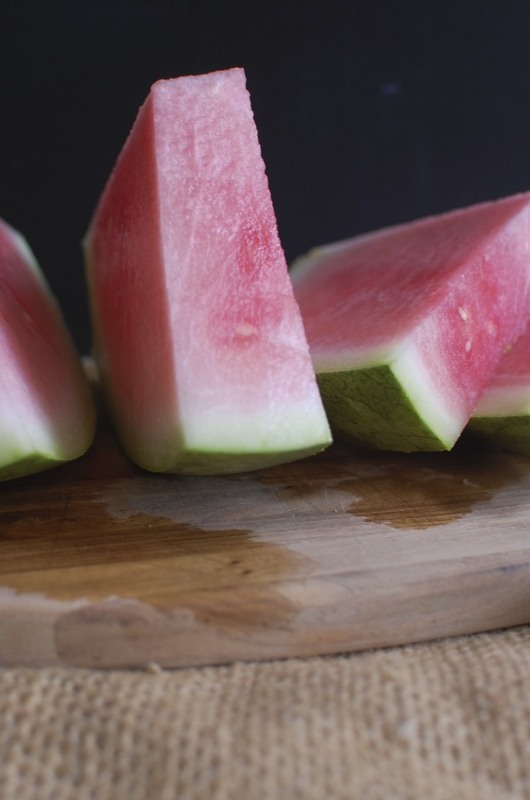 Cut the watermelon into chunks. Depending on the size of the melon, you’ll need about half of it. I just went ahead and cut it all into chunks and saved the rest. Puree the chunks in the bowl of a food processor (or blender) until smooth. Strain and measure–you should have about 4 cups. I like to serve each element of the lemonade separately and let people mix their own. 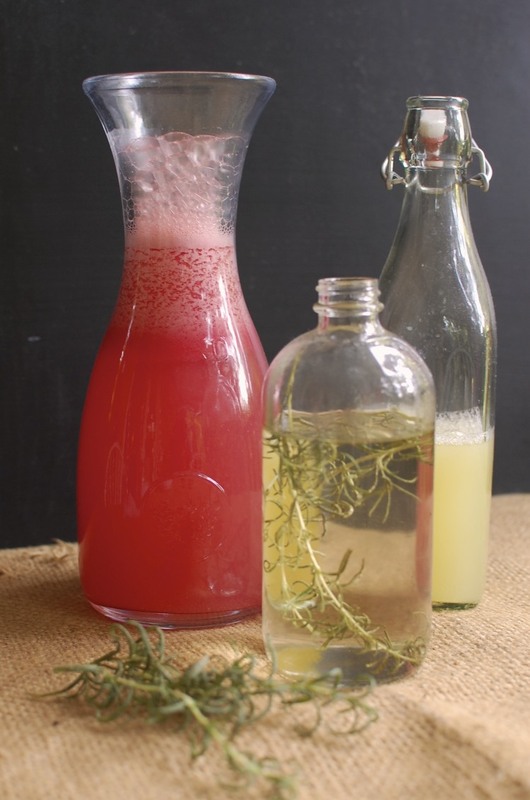 You want the least amount of simple syrup, then lemon juice, and then the most watermelon juice. I usually add some plain water or sparkling, too. You, of course, can add it all together in a pitcher, but you won’t need all of the simple syrup–maybe about half. 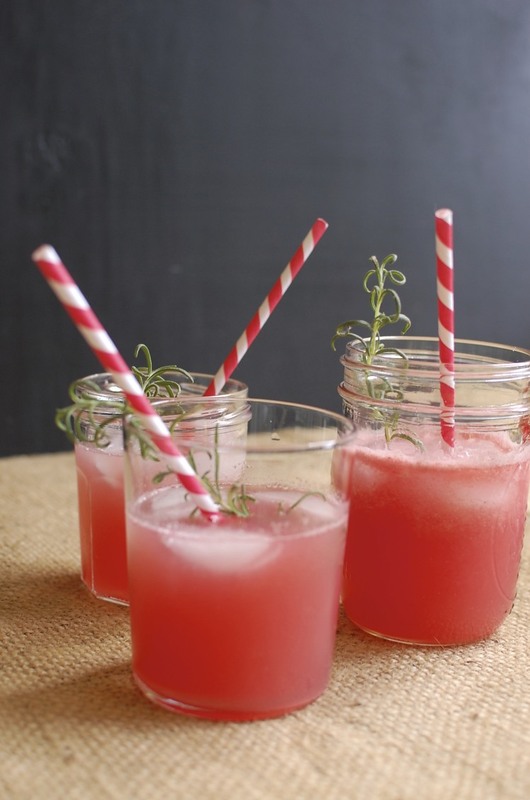 Save the rest for other things–cocktails, added to plain seltzer–you’ll thank me. I have to confess: I’ve been on blog vacation big time this summer. I’ve made delicious things on the grill and not shared them with you. I’ve been on vacations and taken only iPhone photos, and I’ve let many fancy summery meals and cocktails go by without bothering to document them. To be honest, it has been the best. But, I’m ready to be back. I have a list of things that I want to make that just can’t wait anymore. It’s back to to school time, and for me, back to blog time. That said, there is still a little summer left, and I intend to make the most of it. 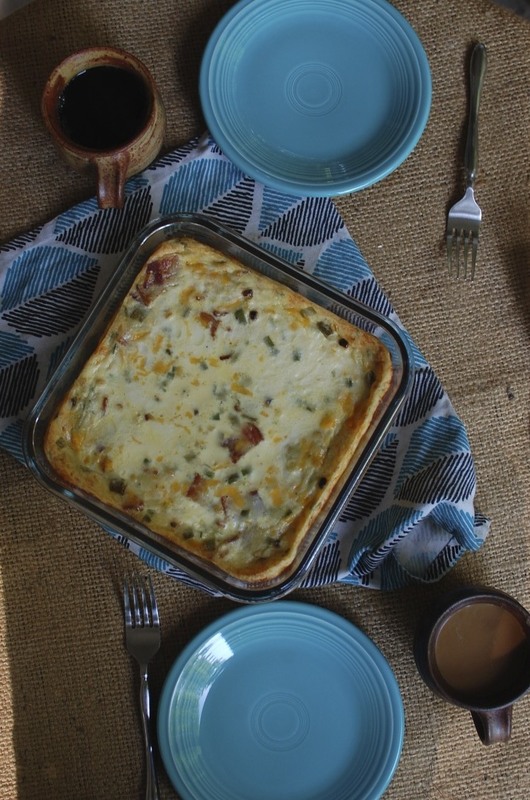 This breakfast casserole is everything you need in a back to school breakfast casserole. 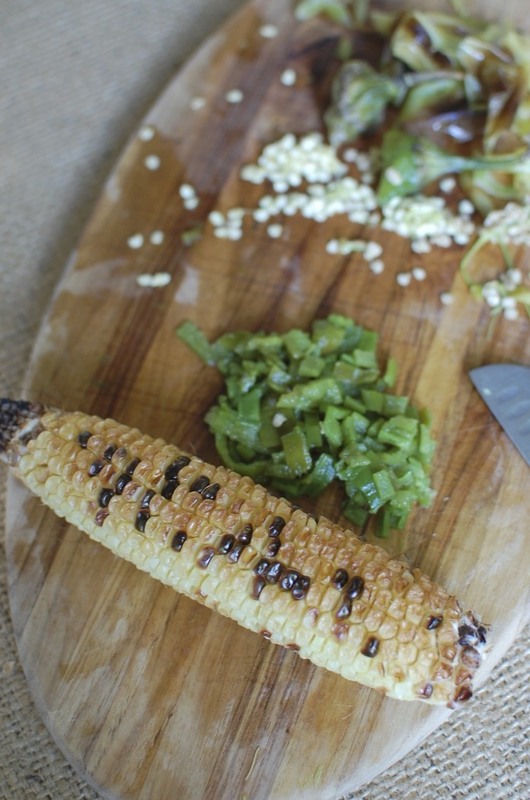 It’s cheesy, bacon-y, and in season with its charred corn and chiles. The charred flavor is almost reminiscent of the fair–the crisp air, buttery corn, and food cooked over open flames. It’s like a nice introduction to the season without jumping right in to pumpkin pies and fuzzy socks. It’s also easy enough to make the day before. I’d store the egg mixture in a big tupperware rather than the pan you’ll bake it in–unless you’re really good at not sloshing. 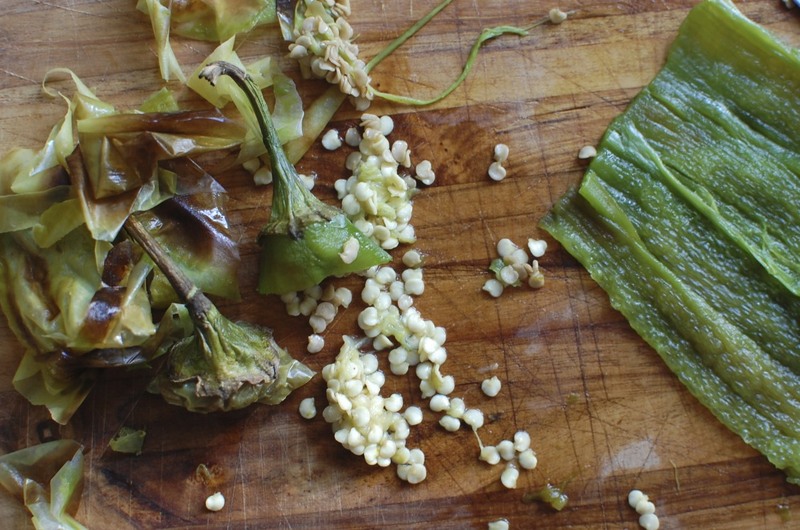 If you’ve never had fresh hatch chiles, they’re on sale right now at the grocery stores. They apparently only have a really short season, and they only grow in one place–the Hatch Valley in New Mexico. 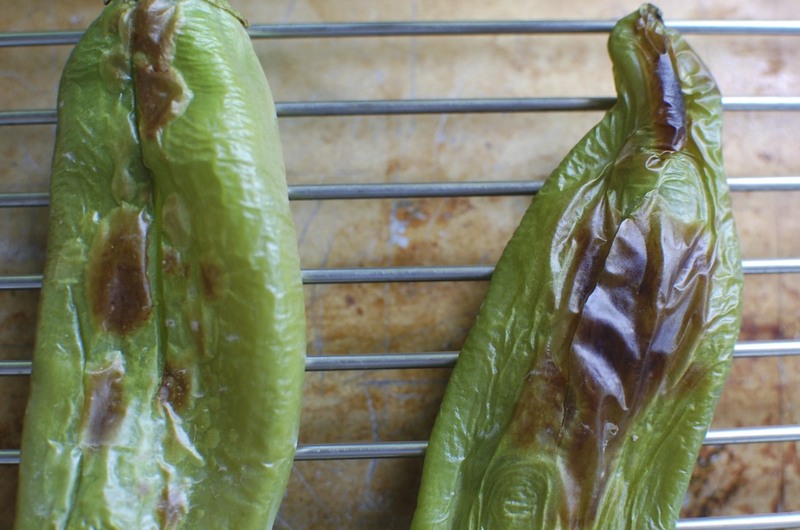 They’re a big, green, relatively mild pepper that is generally a little curvy. They’re sort of a cross between a green bell pepper and a jalapeño in spice level, but they have a really fantastic flavor. Often the roasted green chiles that you can find canned at the grocery store are hatch chiles, and they do make a fine replacement in this casserole. 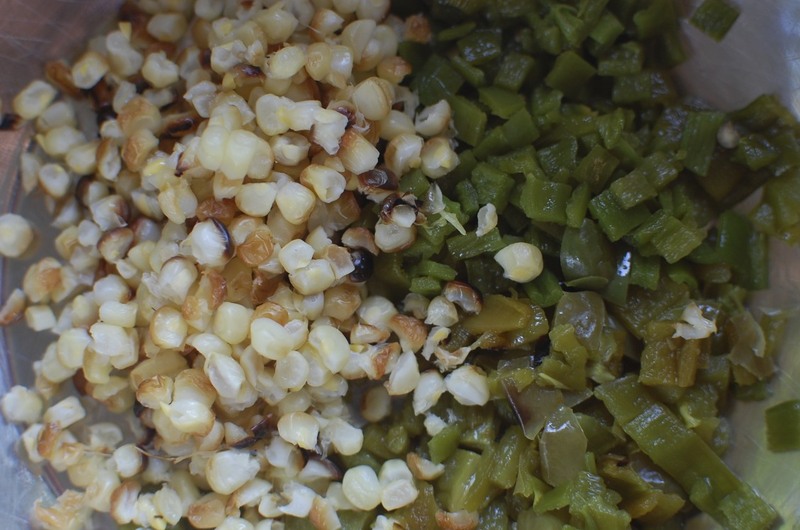 First things first: char the corn and chiles. If you have a gas burner, high five! This is really easy for you. Just put the corn and peppers (one at a time) directly on the pot rest and turn on a medium flame. For the corn, just let it blacken here and there, rotating it with tongs, until it’s evenly charred. For the peppers, let them blister and brown all over, constantly turning them. When you take them off the heat, but them directly into a brown paper bag and close the top. Let them cool for 10 minutes or so. When they’re done cooling, you should be able to peel off the skins really easily, revealing soft flesh, which you then cut open, remove the seeds, and dice. If you don’t have a gas stove, don’t despair! You can always do this on the grill, but I wouldn’t build a charcoal fire for just this. If you have a gas grill, this is your best bet. If not, use the broiler in your oven. Same idea, just put everything on a cookie sheet and turn it often, watching carefully. It’ll take a little longer, but will be just as good. Preheat the oven to 350 degrees F. When you’ve finished cooking the bacon, charring the corn and chiles, you’re ready to assemble. 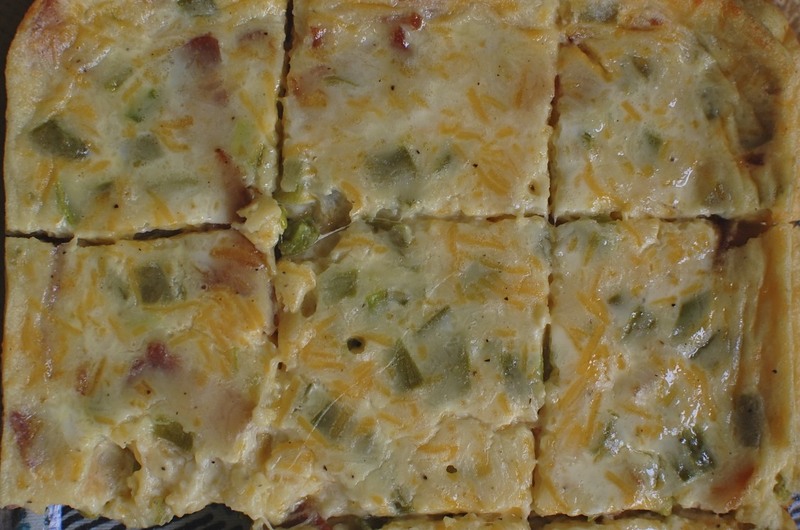 Mix together all of the ingredients, including eggs, flour, milk, cheese, chiles, bacon, corn, salt, cumin, and pepper. Pour the mixture into a greased 8×8 baking dish and put it on the middle rack of the oven. Bake for 30-40 minutes or until the casserole is set. Let stand for 15 minutes, then cut into squares and serve.